If It's Not OK For Him To Take Steroids.... Why Is It Not OK For Her? The dangerous performance enhancing steroids taken by athletes are male steroid hormonal drugs that build muscle. One of their risks is liver cancer. Similarly, female steroid hormonal drugs build breast tissue. They not only increase the risk of liver cancer but breast and cervical cancers as well. These powerful steroid drugs are taken by millions of teenage girls as BIRTH CONTROL PILLS. Why are teenage girls vulnerable to the cancer-causing effects of birth control pills? Teenagers are especially vulnerable to breast cancer risk because their breasts are growing and most have not yet developed cancer-resistant Type 3 lobules through a full-term pregnancy. Therefore, the cancer-causing combination contraceptive steroids (birth control pills) are especially dangerous for them. How do steroid hormones affect breast development? ​Before a full-term pregnancy, most of the breast is composed of Type 1 & 2 lobules, with Type 1 comprising 70% of the breast tissue. Together Type 1 & 2 lobules are where 95% of all breast cancers start. Therefore, steroid hormones are most damaging to the breast if taken before a full-term pregnancy. After a full-term pregnancy, most of the breast is composed of Type 3 lobules which are fully mature and resistant to cancer. This is why a full-term pregnancy lowers breast cancer risk and why women who remain childless have a higher risk of breast cancer. They cause the breast tissue to grow which can result in mutations and ultimately cancers. Estrogens can act as direct carcinogens causing cancer cells to form. ​Every cell contains a complete set of genes composed of DNA in its nucleus. 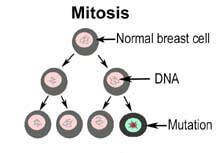 The combination of estrogen and progesterone steroids cause breast cells to multiply by first copying their DNA followed by cell division-this is called mitosis. While copying DNA during mitosis, mistakes can occur which are called mutations. Mitosis of mutated cells multiplies these mutations. Cancer results from accumulated mutations in a cell causing uncontrolled growth. There are breakdown products of estrogen (metabolites) which can directly damage DNA, causing mutations and cancers to form. One such metabolite is 4OH catechol estrogen quinone, which is found in higher levels in women with breast cancer than those without cancer. What is the medical evidence for the link between birth control pills and breast cancer? In medical texts, birth control pills are acknowledged to increase a woman's risk of breast cancer while in use and for up to ten years after they are stopped. (3) There is an approximate 20-30% increase in the risk of breast cancer in women who use these drugs.Through public media coverage in 2002, women of this country were made aware of breast cancer risk from using HRT. As a result, millions of women stopped taking these drugs. Although the same type of drugs found in HRT are also found in birth control pills in even higher doses, their breast cancer risk remains widely unknown by the public. Through their widespread use over the last 30 years, birth control pills and HRT are undoubtedly a significant reason breast cancer rates have increased 40% over that same period, especially in our young women. But don't birth control pills lower the risk of ovarian and endometrial cancer? Yes, they do decrease risk by suppressing ovulation and differentiating the uterine lining. However, according to the American Cancer Society, out of 100 women with cancer, 31 have breast cancer, 6 have endometrial cancer and only 3 have ovarian cancer, so it is not a good "trade-off" in risk. What are some names of these synthetic steroids? Some are ethinyl estradiol, conjugated estrogens, norgestrel, medroxyprogesterone, levonorgestrel, norethindrone, norethisterone, desogestrel, norgestinate, mestranol, drostirenone, onorgestrel, drospirenone, and ethynodiol. Many thousands of cases of breast cancer a year are attributable to these powerful steroid drugs. This is because millions of women take these drugs each year. What about the new patch and vaginal ring? What about injectable birth control like Depo-provera and progestin-only pills? The progestin only injection, Depo-provera, also increases breast cancer risk like the pill. There are no long-term safety studies available for the progestin-only "mini-pills" which have recently become available. Does the morning after pill (emergency contraception) pose any breast cancer risk? The morning after pill (MAP) contains a high dose of progestin. Some websites recommend taking multiple doses of birth control pills at once as a substitute for the MAP where it is not available. These medications may increase breast cancer risk if used regularly instead of infrequently for emergency use as intended. Are there safe, effective alternative treatments for teenagers on birth control pills for different medical problems? Why hasn't the National Cancer Institute (NCI) warned the public of these documented cancer risks? There may be multiple ethical, socioeconomic, political and cultural reasons why this information has not been made readily available to the general public. In February of 2005, Dr. Elias A. Zerhouni, the director of the National Institutes of Health (NIH), which encompasses the NCI, banned all staff scientists from taking drug-company fees because he wanted "the NIH to be a source of health information that could be trusted. (7) Government scientists had moonlighting jobs and were receiving large fees and stock options from pharmaceutical companies, which is clearly an unethical conflict of interest. Former FDA director, David Kessler, wrote the book, "A Question of Intent: A Great American Battle with a Deadly Industry." In it he describes how the tobacco industry, through its economic and political clout, successfully suppressed for decades the link between cigarettes and lung cancer using the NCI and medical groups such as the American Medical Association. Like tobacco, contraceptive steroids (birth control pills) are very widely used, having been taken at some time by at least 75% of American women, often for many years. The belief in the use and the safety of "the pill" is deeply engrained in American culture and the culture of American health scientists, in both the government and the pharmaceutical industry. Why haven't cancer and medical organizations publicized the link between breast cancer and the pill? These organizations take their lead from the NCI and other governmental agencies which at present have not widely publicized this information. (3) Bland KI, Copeland EM. The Breast: Comprehensive management of benign and malignant diseases, 3rd ed. Saunders 2004;v1:499-535.